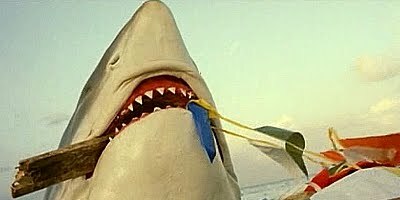 A coastal town finds itself terrorized by a giant Great White shark in Enzo G. Castellari’s blatant rip-off of Jaws and Jaws 2. In fact, Universal Pictures filed a lawsuit, which resulted in the film being removed from theaters in the United States. Numerous scenes are almost identically copied from both films, as are the main characters themselves. James Franciscus’ Peter Benton is Sheriff Brody, except here he is a writer. Vic Morrow is Ron Hamer, a Quint clone in accent and appearance. Although lacking the suspense of the Jaws films, there are a few tense scenes, accentuated by Guido and Maurizio De Angelis’ score. The shark is not very impressive, especially since it doesn’t match up to the underwater stock footage of real sharks, but is an admirable effort. Some liberties were taken with realism, such as having the shark roar or bob at the surface with its head above water. Despite the unoriginal plot, unconvincing special effects, and terrible dialogue, this film is very entertaining. Morrow’s performance is over-the-top and the finale is unintentionally hilarious. Fans of Castellari may like this, as well as those who enjoy Jaws-inspired films.